Golf Ball Sized Apples Bring Easy, Healthy Snacking Innovation – StratGo Marketing. Plug-in marketing department services. Photo: Havelock North Fruit Company. A New Zealand company has come up with a new, innovative concept to market a product that’s thousands of years old: the apple. It’s a combination of agricultural technology and smart marketing. The Havelock North Fruit Company developed the capability to grow mini apples that are just 1.5 times the size of a golf ball (via cross-breeding selected varieties). Next came packaging inspiration that put five apples into a hand-held , transparent tube. The concept was tied together with an attention-generating brand called Rockit™. Havelock didn’t have to worry about product benefits – everyone knows that apples are healthy eating. Instead, the company added convenience, and made a good-for-you product easier to consume and transport. The result is a highly credible positioning as an on-the-go fresh-fruit snack, with a simple tagline: Your Daily Fruit Blast. Find ways to bring new news to an old product. Havelock has an interesting business model. The company is licensing rights, with the expectation that the licensee will eventually grow its own apples. In the interim, apples with be shipped to global markets from New Zealand. Current distribution includes the United States, Canada, Italy, Hong Kong, Taiwan and the UK. A New Zealand company has demonstrated that innovation is possible even for a product that’s thousands of years old. 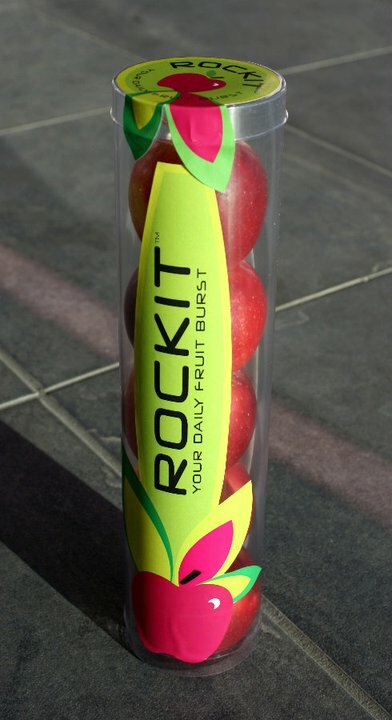 Golf ball sized Rockit™ apples, packed in hand-held, clear tubes, provide a convenient solution for healthy, on-the-go snacking. ← How NOT to Engage Customers: NY Mets Strike Out with Fan Letter. Very interesting and inventive. Although I wonder if the idea will come under fire from the ‘over-packaging’ crew – – or if people still feel the need to squeeze their own apples (so to speak) before they buy.